› Author AffiliationsThis work was supported by the University of Virginia, the ACS ­Petroleum Research Fund (ACS PRF#56158-DNI), and the National ­Institute of General Medical Sciences of the NIH (GM124092). Predictably site-selective catalytic methods for intermolecular C(sp3)–H hydroxylation and amination hold great promise for the synthesis and late-stage modification of complex molecules. Transition-metal catalysis has been the most common approach for early investigations of this type of reaction. In comparison, there are far fewer ­reports of organocatalytic methods for direct oxygen or nitrogen insertion into C–H bonds. 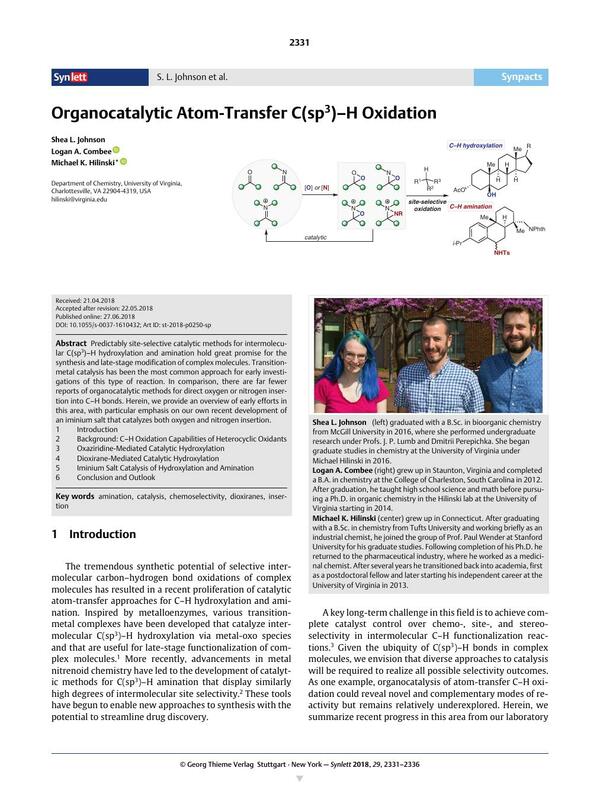 Herein, we provide an overview of early efforts in this area, with particular emphasis on our own recent development of an iminium salt that catalyzes both oxygen and nitrogen insertion. 22 A mass consistent with a diaziridinium species derived from 19 was observed along with major fragments consistent with its formation. Numerous attempts to isolate compounds arising from the reaction of 19 with PhINTs failed due to instability of the products.